“I remember the first couple of times I watched him five, six weeks ago on video, I had to get a flip card to figure out who he was,” Pittsburgh Steelers coach Mike Tomlin said. Broncos star linebacker Von Miller knows the feeling. He recalled that when Lindsay first showed up, he was known simply by the No. 2 jersey he wore. As in, the Broncos’ best offensive player. On Friday, Lindsay said he appreciated the nod from Tomlin. Welcome, Mike Tomlin, to Phillip Lindsay’s told-you-so tour. “I’m proud to be undrafted and to be able to do the things I’ve done because it’s a slap in everybody’s face,” Lindsay said. “But you know at some point in time you’ve got to get past that and you have to go for other things that have that chip, something else has to always feed you. Lindsay also uses the combine snub as his motivation. “Oh yeah, it’s disrespectful. But it fueled my fire and got me here to where I am today,” Lindsay said. On opening weekend, Lindsay’s 102 yards from scrimmage made him the third undrafted player — and first running back — in the common draft era (since 1967) to top 100 yards and score a touchdown in his NFL debut. With fellow rookie Royce Freeman, a third-round pick out of Oregon, injured, Lindsay made his first start in Week 8 at Kansas City and rushed for the most yards (95) in team history by a rookie in his starting debut. Lindsay is averaging 5.5 yards a carry and has rushed for 670 yards and five touchdowns, including two against the Chargers last week. He also has two dozen catches for 187 yards and a TD. Lindsay has become so valuable on offense that the Broncos are using Devontae Booker to return kicks and River Cracraft to return punts even though Lindsay is the team’s best player at both. “Obviously, it’s Week 12 and it’s not a fluke,” Broncos coach Vance Joseph said. “He’s a really good player. He’s a durable player and he makes plays every week. 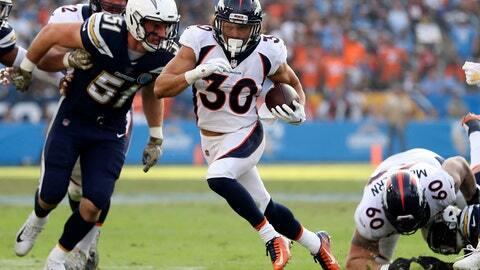 Several teams reached out to Lindsay and his agent after he went undrafted, but the Broncos had a built-in advantage. The first player from the Broncos Futures Football program for middle schoolers to sign an NFL contract, Lindsay starred at Denver’s South High School before playing for the Buffaloes. Lindsay said he wanted to stay close to home — or, rather, at his parents’ home.